SSFFriend: Email This Page to Someone! I have a silver tankard stamped Minott by the handle. I have researched as much as I can, but would love any other info members can provide me. The Tankard has a spout (most likely added later) to the side of handle not directly across from the handle. On the side opposite the handle there is a coat of arms engraved. Welcome to the Silver Salon Forums. Knowing more about your interests in learning about this tankard would help members better answer. 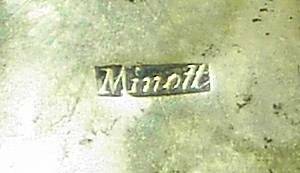 Samuel Minott was a silversmith in Boston< well respected in his day. He was arrested as a tory at the start of the Revolutionary War. He later was released because he continued working as a smith until his death in 1803. I would love to know more about his arrest and incaceration. I found out that spouts were added to many tankards because of temperance concerns, but I have seen spouts added opposite the hande never on the side of the tankard. It seems they turned many of these tankards into ice tea pitchers. I have been up to Sotherby's and saw a lot of silver from the perion, some of which had been altered, but none in this manor. Since putting the spout opposite the handle it might have covered some of the crest, I figure the crest was still in the family. I have tried looking up the crest, but have not been able to pin it down yet. On the handle there is another engraving saying "B.S. to S.S." so I assume the surname begins with the letter "S". It seems that Minott worked closely with(but not in partnership with) John Coburn and Paul Revere. Coburn and Minott made some matching plated for a Boston Church (3 each). And there are notations that Revere did some engraving for both Coburn and Minott. Minott created a presentation Tankard that looks the same as mine for Harvard (featured in the engavers journal Nov/Dec 1976).In a book in the New york Library there were maps of boston that showed the silver shops in Boston and Minott had several over the years some with others, but the partnerships seem to be earlier that this piece as the mark is just Minott. 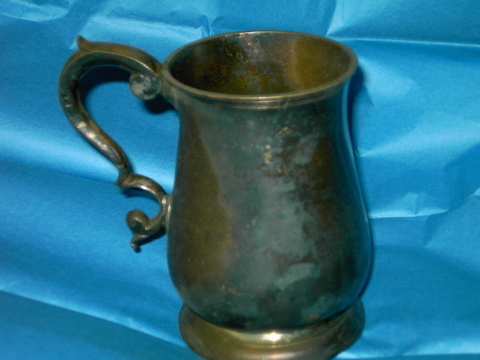 The tankard itself is 8 1/2 inches tall 5 1/2 inches at base. Tapered to the top with a rounded cover with a finial on top. There is a band around the middle. The engraved crest is from the top of this middle band to the top rim. The Minott mark is not on the bottom but to the left of the handle near the top of the body. The Spout quite large witha strainer incorporated. The spout 2 inches wide at the top and tapers down to the middle band. 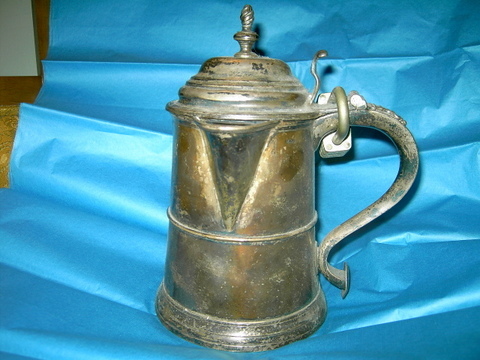 The stainer is a several dozen holes from the body of the tankard that leads into the spout. There are nearly 30 tankards by Minott known. It may be possible to tell you who the initials on yours represent, as there is a published tankard with those initials and a coat of arms. Do you know the history of ownership of yours? Is it a family piece? Usually new members have a problem with posting oversized images, but yours are too small to be examined criticallly, being less than 100 pixels in width - they should be no more than 490, but certainly at least 300. Please post larger versions of your photos, including one of the initials and another of the entire tankard. At this point all that can safely be said is that the placement of the mark is correct for the period, and as you surmise, it may be a fair guess that the spout probably has been added. We really need to see more and larger pictures. I should add that an object of this nature is of considerable significance, and that any information given based on photographs or verbal descriptions cannot be considered definitive. Such an object requires authentication by direct comparison with another similar object, probably in hand by a museum curator who has access to another example. We are excited to see such an object, and anxious to be of help, but please understand also that we will require from you further information, as Scott has requested, about yourself and your interest in finding out more about the object, before going further. the dates of those relatives were aproximatly right and there were some "S"'s there but I now need to find out the right coat of arms. Since silver was new, you can imagine what Heraldry was like. I have a request in with the college of arms to see if they can figure it out, but that may come to naughht. So I stumbled across your site and thought I might give it a whirll. Now I took the pictures about a year and a half ago, but did not take any of the whole tankard, and now the thing is very tarnished again. I will take some more shots, but excuse the color. I didn't want to keep polishing it and posibly damage it. Also there is a padlock on the handle, that I don't have the key for, so I have to figure out how to get that off without damage. the padlock was put there because my brother had really good darts he wanted to lock up from us and that was the only covered vessel. The mark looks genuine, it matches closely the photo Kane's Colonial Massachusetts Silversmiths. The initials look contemporary. 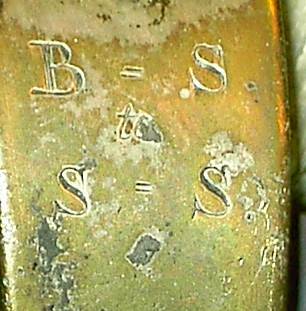 In Kane's list of recorded objects there is a tankard with these initials for Benjamin Smith and Sarah (Smith) Brown. This tankard was published Antiques vol 104: p. 998 (December 1973). The crest above the arms is a Unicorn's head, erased, as shown in Fairbairn's Crests, plate 67, fig. 1. There is no reference to this crest crest for Smith, but there is for Smyth (Yorkshire); minor changes in spelling of names were common, and some well-to-do families owned two or more tankards, so it is possible that this is the same family, but the crest on the published tankard should be compared as well, to be sure. Congratulations are certainly in order - your impulse to "take them all" was precient. It does happen every once in a while that important pieces come out of attics and basements where they have been hidden away for years, but never with darts padlocked inside! We would like to see the Coburn piece as well, as it may also be unrecorded. The tankard looks typical for the period and place; the spout does not look original to me. Tankards are sometimes found that have had added spouts removed, but I would not attempt that -- I would just consider the modification as part of the history of the piece. Peter your tankard is special and if a family piece even more so. The dart part of its history, is sending a few shivers through this crowd, and I won't say what the lock is doing (actually it is a delightful part of its history and a lesson to all collectors that you never know what that silver has been through)! Your instinct to leave well enough alone is right because silver is a soft metal and at this point in its life it should be seen by a good silversmith. The lock must be removed with great care because it will do damage just knocking against the tankard that will not be reversable. Take good care of this and you will have a family treasure. That is a very wonderful piece. You say there are two of them? I wish I could come across a piece like that. Very nice engravings also. The other piece is signed "J.COBURN" by the handle. And I have learned is called a cann. The only engraving on this piece is "A.S." on the handle. It is obvious that the spout was placed on the side (although that position is not unique) to avoid disturbing the coat of arms, which was thoughtful, even if the alteration was not. However, at the time it was done, it probably was not yet an heirloom piece, and provided a more practical, if awkward, use as a pitcher. There is nothing in Kane's list of Coburn objects with those initials nor anything made for the Smith family. Can't win them all. On the assumption that both pieces were made for members of the same family, it might be possible to make a tentative identification, but if these Smiths were not in your family ancestry, it would be difficult to do as there are an awful lot of Smiths. Still, it is a nice piece to have, to say the least. When you have shown this to whom ever will free it you can talk about the pros and cons (and cost) of removing the spout and restoring it to as close to original. It is not an easy job and should only be done by an expert hand. As to resoring the piece and removing the spout. I don't think I would do that. My Mother's family were anglicans and lutherins so they tended not to drink. Maybe that is why somebody put the spout in. Now that it is in the good catholic family of Sullivan the irony is sweet. Removal of the spout depends on what the tankard means to you - it only detracts from the piece if you are interested in how much you can sell it for, since some buyers insist on things being as original as possible, If you do it, it will be twice altered, rather than once. Provenance is more important, as if it is a family piece, I would leave it unaltered, as it is part of its history. I don't care how much tarnish there is, or how big the spout is, and we don't give evaluations on this site, but a couple of hundred is pure hogwash -- they probably wanted to get it from you for that price! I would suggest you contact a curator at one of the museums that keep silver collections for a recommendation of a good restorer if you want any work done on either of these pieces. And be careful what you ask for -- you want to get it cleaned -- not polished! Keeping your silver clean and behind glass in a dustproof hardwood cabinet (not pine or other soft woods, nor oak) is the best way to retard tarnish. You can use an inert dehumidifer like silicagel in the cabinet, if you wish. It is also possible to have the pieces lacquered,which will do no harm if properly done, but some people do not like to do that. Another thought: do not under any circumstances risk damage to the tankard by attempting to cut off the padlock - see a locksmith who can carefully open the lock for you. I would very carefully hand polish it. Definately not any type of buffing or machine polishing. Once shined, keep it wrapped in cloth and no oily finger prints. That should keep it shiny and nice looking for a while. And definately be very careful in removing the lock. The dealer who told you it's worth a few hundred bucks, stay away from him, he wants to rob you! I'd buy these things all day long at that price! Nice pieces! If you have a locksmith remove the lock, which is a good sugestion, hopefully he can pick it. If he has to cut it put a thick cloth or leather around the tankard and tape underneath the lock itself so it does not get further dents and scratches. Make sure that no stress is put on the handle, it is hollow and can easily be bent or dented and that is almost imposible to repair. I liked your thinking on keeping the spout. There is a school that now thinks these changes should be kept as part of the objects history. at this point in its life it should be seen by a good silversmith. Peter, Agleopar's injunction probably should be taken to heart, both for the tankard and the cann. It is hard to tell from pictures, but it looks as if both have suffered from neglect and mishandling in the past; if there are any encrustions on the surface it may be that even hand polishing should not be attempted until there is an even surface to work with. The surface texture (patina) that has accumulated over time, if not too badly damaged, should be preserved if at all possible, and overpolishing could destroy it. It may be that some other treatment might be required, such as ultrasonic or chemical cleaning, but that is for a conservator to determine. You mentioned insurance. 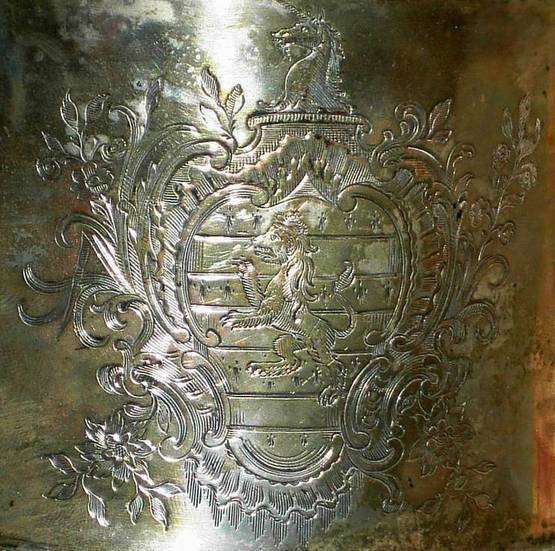 A colonial tankard is the Holy Grail of American silver. 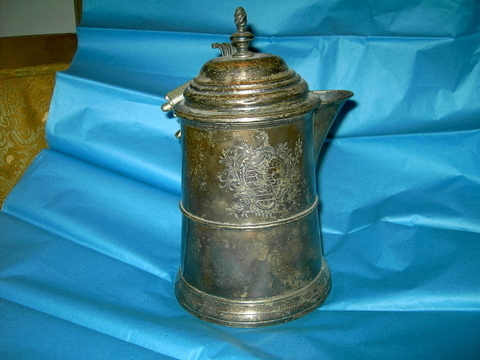 All other things being equal, the larger and older an object such as this is, the less that resolvable condition issues will affect its value, so however much this tankard has suffered from neglect and abuse it is restorable and worthy of being insured, but for how much is for a qualified appraiser to determine. It is only infrequently that "new" old objects such as these are brought to these forums, and it is with real pleasure and sense of accomplishment that we are able to contribute in whatever way we can to the discovery and preservation of these hitherto unrecorded treasures, and add to the body of knowledge of the artisans that created them. Thanks for giving us the opportunity to share in your good fortune. Stay with us, and let us know how things turn out. If the lock is a common brand it doesn't even have to be picked -- you just take the numbers (usually near the keyhole) and brand to a locksmith, and they can give you a key without even having to see it. Both pieces are spectacular, and I wouldn't do any further modifications. I wouldn't lacquer them, either. It's been said many times, but the old butlers' trick was to store silver with a piece of common chalk, like used on a blackboard. I'm not sure why, but in a closed space (drawer or display case) that really does inhibit tarnish. As for polishing to get to that point, why pay someone else to do it? Just get some non-abrasive polish and a rag, and relax for a few minutes rubbing away the tarnish. Then you've given a bit of yourself to the piece, as well.... I'm not saying not to let a silversmith take a look at it, just that I prefer to take responsibility for my own polishing. Thats based on the assumption you use the correct polish, and I would still consult someone knowledgeable(our many members?) such as a silversmith who deals in preserving old silver. I am not too experienced with polishing, but, before I knew anything about correct polishing habits, I have caused some minor unnecessary wear by doing it improperly. There is no rush with old pieces like these, so make sure it is done properly the first time. What a great bunch of stories. As a curator, I'd side with the "do no more harm" crowd. The spout was added most surely, as others suggested, to turn it into a water pitcher, possibly even as a "temperance" measure--but it wasn't a rare occurence. It is a nicely designed spout, carefully thought out and (saints be praised) avoiding the beautiful rococo coat of arms. The lock is a scream, especially since you know the story (imagine the head-scratching without it, and what a creative boy your brother was). Once you remove the lock (see above) you can safely clean and polish (i.e. make shiny, not buff) the silver with calcium carbonate (chalk powder) and isopropyl acohol, using cotton wadding. It's not hard at all. Polyethelene zip-loc bags will not damage the surface, but it must be dry before it is bagged. If you clean with alcohol and do not use water, you won't have this risk. Of course if you want it on display, then the advice given above is great. What an incredable find and what a neat story behind it. I too vote not to remove the spout. Our resident curator gives you good advise to polish it as he describes. Do NOT let anyone buff it with a machine polisher. I would stay away from that antique dealer as recommended and would enjoy your treasures and be sure to use them by drinking an ale or some other brew from them. These items were meant for use and stay alive when they are used. Museums are a great way to share them with others if you decide not to keep them in the family. Congratulations and thank you for sharing these treasures. The Boston Museum of Art documents has a similar Coburn cann in their collection. Thanks for all the helpful information. I went up to the research library in NYC and looked into Patricia Kane's book on Massachusetts Silversmiths, it was excellent. It does sound like it could be the Smith crest. The refernce to the Antiques magazine was a bust though, it shows a side view of the tankard in question. I wrote to Ms. Kane at the Yale address that is listed on the website, and sent her the pictures to see if she could help. In terms of cleaning and preserving, I haven't gotten that far yet. But, I did go to my Mother's house and get the copy of the family tree that was done in 1986. There is a Smith (Abigail) who lived in the right time period 1732-1840, and in the same general region. There is not that much info on her. She married a 6th generation relative of mine named Benjamin Rice, they had a daughter Abigail Rice that married into my direct maternal clan of the Hollands. So the initials on the Cann might be hers. Thanks for all the help. It is starting to get pretty cool finding this stuff out. It is starting to get pretty cool finding this stuff out. You are right - it just starting, and you ain't seen nothin' yet! Watch out - you might have been bitten by that nasty Old Silver Bug (Argentus archaeus insidious)! You are making good progress. Keep up the good work. Where is our resident genealogist when we need him? All I want to say is thanks for showing it and I love the story! Even I (the resident amature) know that a couple hundred is absurd. Isn't it fun to recognize that something is very special that everyone else in the family has discounted. And the research is an awful lot of fun, especially when you can start to see the whole picture starting to come together. I hope you can figure out who the initials belong to. I still have a few things that I can't identify. Maybe the neighbors came over to visit, got drunk, and left their tankard. Fred is so right. Using a piece brings it to life. Please, clean carefully and kindly, then serve some beer. Let us know how it tastes. It is likely that the original owner was Sarah Smith, born 13 May 1738 in Providence RI, daughter of Daniel and Dorcas (Harris) Smith. She married John Brown on 27 Nov 1760 in Providence. He was a prominent and wealthy citizen who, with his three brothers, helped found Brown University, eventually giving the college more than $150,000 in endowments. Sarah Smith's elder brother Benjamin was also a prosperous merchant in the town and the tankard may well have been a dowery gift. I have not found anything indicating its possible descent. Benjamin Smith died in 1759, so the tankard may have been a legacy left to Sarah. Kane also records a teapot by Minott engraved with the same Smith arms and SS for Sarah Smith; pictures are on file at Yale. Minott is known to have bought in larger, more complex pieces from other silversmiths, notably Paul Revere. It is tempting to speculate if the engraving, at least, was by his hand. A check of his daybooks in the Massachusetts Historical Society may prove fruitful. Wow, the story keeps getting better and better! Someone suggested adding this thread to a list of top discussions. If Scott believes it would be fruitful, I might even admonish the forums to add a prominent link at the SMPUB Forums' front page for visitors to click and view the kind of discussion that makes this site so exuberating and inimitable, including fascinating stories and finds like this one. Since last heard from I have contacted the British College of Arms, trying to trace the Coat of Arms on the tankard. The York Herald finally got back to me (don't you love that title). The Arms (the main part) is very similar to a Smith family Arms from the 1500's. But the Crest (the top part with the Unicorn) does not match. He said that it could be a combination of the arms of two families that was not registered. He said that was somewhat common for people living in the colonies. He also suggested contacting the Scottish and Irish registries. I have done that this week, hope to hear something back. Maybe I'll go up to the John Brown house in Providence to compare my tankard to the one there. My email requests have gotten no responses. Nor did Professor Kane reply to my queries. Thanks for letting me post in this area of the forum. Any other suggestions? all would be appreciated. I have gotten responses from the Irish and Scotish heraldry organizations. They have no record of that coat of arms. I know that I am a nyophite at doing this research. But I figured I would go up to the John Brown House in Providence. I got an extra couple of day off unexpectedly, so I figured I would drive up from NYC and make a long weekend out of it. I emailed the contact email address on the website. I figured I would let them know I had a possible companion to the tankard in the collection, and would love to be able to look at the one on display. I gave them my contact info, and asked if I could meet the curator while I was there. I heard nothing back. So a few days before going up I did a little more research and found the email address of the Rhode Island Historical Society assistant curator in charge of the John Brown collection. I emailed her directly, attaching the photos. She got back to me - letting me know that the tankard was not currently on display. And that if I wanted to examine the piece I would have to give them 2-4 weeks notice and pay for the curator's time to let me look at the item - and only on Mondays when the house was closed to the public. In addition the curator let me know that for a fee I could have a photo of the piece could be taken and sent to me. So I got the correct forms and am now sending in the request. I'll let you know what happens. They say on the forms(this is really only a request for the cost estimate) that they will let me know in a few weeks. Then probably another few weeks before I get the photos. You are wise to do what you can to document and verify your tankard and it looks as if you are prepared to meet and deal with any difficulties you may encounter. I would have thought they would have been delighted to have you bring in your tankard and meet it's possible mate. Thanks for keeping us posted. Has the lock been removed from the tankard? Good luck and I am anxiously awaiting your next post. I too was wondering about the lock. I hope you continue with your investigation. I am always amazed how easy the History Detectives on PBS gain access to top researchers, libraries and other sources of information. Maybe PBS would be interested in your story. Having found a good piece several years ago, just as you have, you will find that the folks here offer the best advice, I have proof....! Having said that, you have two beautiful pieces that your family should cherish as heirlooms from now on. Make sure you collect all of the history and document these pieces in two different places in case of disaster (fire, flood etc), Keep one in a safe deposit box, or another family member you trust in a different state, and keep them updated as new information is collected. Identify these in you will as a specific item with clear instructions as to where it is to go and I suggest that you chose someone with reverence for your family history, and the financial where-with-all to insure the piece does not end up lost, due to failure to secure it properly, or financial need. I have struggled with the same issues and have personally decided to create a living family trust as no one in my immediate family has shown any particular interest in preserving my collection. I have funded this with a simple life insurance policy (single premium) I paid for, that when the proceeds are paid out, that the funds are sufficient for the interest on the principal to maintain the continued cost of the trust for the foreseeable future. I have arranged that the control be vested in the trust department within a large (financially secure) financial institution, with specific instructions as to the ownership while in the trust, and instructions for disposal of the property inline with my wishes, if and when the trust is ever challenged in the future. The details you can work out with a reputable financial planner and/or your banks trust department and your attorney. Families get funny when inheritance comes into play, and there is always one that thinks they have been cheated or are convinced that they can get some additional value in some cases. I mention all this, as there are practicalities of being possession of a significant piece of history that you want to maintain for posterity, and there is no way to predict the future, nor the sensibilities of future generations. You must assume you are the only one in your family that will have the same passion for this and the future generations of your family that do appreciate these artifacts may speak kindly of you for this insight. You bet! And to the Amen I'll add many thanks, t-man-nc, for such clear and wise elucidation of A Plan to Protect One's Collection. Back again to tell you of the continuing saga of the tankard. To answer your questions. I have not taken the lock off yet. I have not done anything to the tankard yet. I figure do my research first then once I know alittle bit more start to think about how I will preserve it and display it. I don't think that I would do restoration work on it, just clean it up a bit. I did ask a locksmith if they could get an extra key for me, they said they couldn't. They could pick the lock or cut it off. I don't want to carry it in to a locksmith yet, until I get mare info on it. I got the price quote for the pictures from the Rhode Island Historical Society. They sent me an invoice for $25 dollars per picture plus a $5 handling fee. A little high for a couple of digital shots to be emailed to me, but what am I gonna do? I sent off the check for a picture of the Coat of Arms and the initials on the handle. You would think that would be simple, but they are going to send me an agreement to sign after they get the money. that I have to sign and send back. This is to assure them I will not publish the photos. It seems the fee for reproductive rights are more expensive. Do you think that would include posting a copy in this forum for your advise? I would love your opinions. I guess it will be spelled out more clearly in the agreement. Any other advice would be nice. I don't know about the trust thing, my family is pretty interested in this now that I've done the research. It would also be nice if I can find out more about my Smith relatives. I don't know what I'll do eventually. If anyone would like to see the piece itself and give me more help on the reseach (and seem like a reputable person) and you are in the NYC area let me know. Did you ever track down a copy of Antiques vol 104: p. 998 (December 1973)? That is the first thing I would do. That was one of the first things i did. The NY public library had a copy. The picture was about 1 inch and a side view - no picture of the engraving. I am curious if it is normal for organizations like this to charge for such limited research and to restrict what one can do with the final research effort. Does anyone else have experience in this area? Yes, it is normal for such organizations to charge for photos. That rate is somewhat on the high side, in my experience, but by no means the worst I've seen. From their point of view, they have to keep a photographer either on staff or on call, have a curator pull the object and replace it and complete the paperwork documenting the process, and usually will then keep the photo archived so that's it's available at a lower cost if someone asks down the road (existing photos on file are usually charged at a lower rate than new photography). All of that costs money. There also is generally a charge for a researcher's time when you ask someone to do research for you at a remote facility. Not for simple questions, but if there's any real time expenditure involved. Some places have staff researchers; others maintain lists of local researchers who can be contracted to do research. One should always ask permission before reproducing any image or text, including use on the internet. Most places will grant permission for free or a token charge if the use is non-commercial, but charge more for commercial use. Some just have a flat fee. Most will have a statement of attribution that must accompany reproduction. Many research facilities now will allow researchers to take photos with their own cameras, which is a great boon with digital imaging. But you still generally must agree not to reproduce the material without permission.